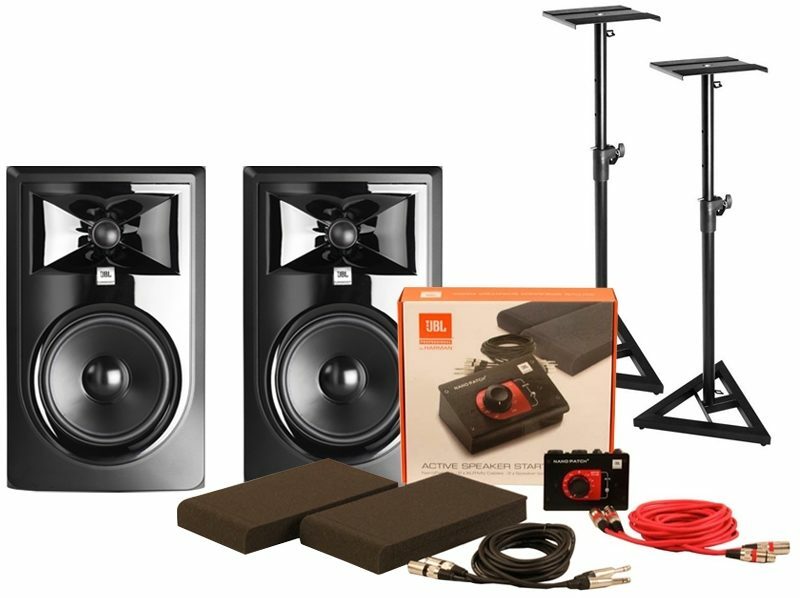 Since their release, word has spread on the quality and value found in the original JBL 3 Series, resulting in wide adoption from hobbyists to high-end professionals working in music, film, post, and broadcast production worldwide. With such an obvious hit, you might ask, "Why update now?" On every project at JBL, there's always a handful of features or improvements that the engineering team can't squeeze in before going to production. 3 Series was no different. When the opportunity presented itself, JBL decided to make those final improvements to the transducers, add a frequently-requested feature, and apply manufacturing learnings. The result: an edition of this popular studio monitor that retains the best qualities of the original, but now looks better, sounds better, and provides transparent sound in even more production environments. To help you make the best mix decisions, JBL equipped the 308P MkII with acclaimed 3 Series transducers that now perform even better. Hear deep, accurate and tightly controlled bass thanks to a long-throw 8" woofer and the patented JBL Slip Stream low-frequency port. Enjoy soaring, immaculately detailed highs via the woven-composite 1" Neodymium tweeter. JBL engineers took things to the next level with faster HF transient response through fine-tuned ferrofluid damping, and greater low frequency linearity and lower harmonic distortion courtesy of an enhanced woofer design. The result is a studio monitor you can trust -- with unmatched peak handling, stunning dynamics and neutral frequency response that's unbeatable in its class. JBL 308P MkII is ready for the most demanding production styles right out of the box. Dual integrated Class D power amplifiers, custom designed by JBL for each transducer, give you generous dynamic range for any project. From music production and podcasting to cinematic sound design or daily vlogging, enjoy the output and power you need to hear exceptional detail at any volume -- even at peak SPLs. Simply plug in, power on, and start creating. The dimensions and acoustics of a room can have a major effect on sonic accuracy, and that's why the JBL 308P MkII lets you adjust the response to fit your studio. The Boundary EQ attenuates the low-end boost that can occur when you place monitors directly on the desktop or near walls. The 3-position HF Trim switch allows you to adjust the high-frequency response of the 308P MkII to tailor it to room acoustics or personal tastes. The design of the 308P MkII leverages over 70 years of JBL acoustic expertise to create a refined studio monitor at an outstanding value. While other manufacturers use off-the-shelf components and make subjective decisions about the sound, JBL builds speakers that squeeze every ounce of performance from each component to deliver efficient, accurate sound reproduction. 308P MkII is designed to JBL's Linear Spatial Reference criteria -- a series of 72 individual measurements taken 360 degrees around the speaker to ensure a faithful reproduction of your mix, whatever your listening environment.